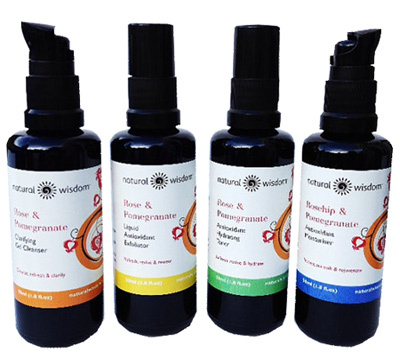 Natural Wisdom is a small, natural skincare company founded by homeopath Maeve Smith, who uses only natural ingredients in her formulations. The ranges are handmade by Maeve using organic, food-grade ingredients which are cold blended to preserve the raw, bioactive compounds present. We’re always happy to support smaller ‘free from’ enterprises at SkinsMatter.com and were really keen to put some of the products through their paces. Two new, first-time testers – writer Rin Simpson and Carousel Diary blogger, Katrina – went to work with the Natural Wisdom Cleanser, Toner and Moisturiser for over a month, and this is what they had to say about the trio. The cleanser didn’t foam much but it seemed effective and it had a lovely gel-like texture. The pump action was useful, and this was probably my favourite product of the three. This was easy to apply, use and rinse. I would prefer if perhaps the cleanser foamed slightly, but this isn’t a great flaw. It left my skin feeling very clean once I had rinsed it off. After continued use I definitely noticed an improvement to my complexion, something that is probably more obvious as I normally only use facial wipes which do not remove all traces of make-up. This has also helped to calm the appearance of spots. The toner was pleasantly floral (it contains rose water), and it didn’t have the ‘burn’ that some other brands do. I really liked this, and the scent too. It was easy to use and apply. The texture was fine, as standard with most toners. Fresh and lovely to use. It applied easily and on first use left my skin feeling clean and soft. After continued use I continued to notice an improvement. My skin looks bright and perky. Again I liked the pump action. Although the moisturiser was light and easily absorbed, I found the smell unpleasant and it lingered, unfortunately. I did not like the smell, and this seemed out of place alongside the other two. It was almost slightly sticky to apply and didn’t leave my skin feeling as it would normally with any other moisturiser. I persevered with it but, alongside the smell, didn’t feel it was something I would purchase and use ordinarily. I didn’t notice any vast improvement in using the product: my skin felt and appeared as if I had used any regular moisturiser. At first, I was satisfied with the results. However, over time I noticed that my skin was more blemished than usual, and I had the first blackhead I’d had in ages. My skin was a little dry in some patches, while other patches (e.g. round my nose) seemed oily. The packaging of the entire set was very attractive: slim blue glass bottles with beautifully designed labels. There were no ingredients which concerned me in any of the three products I tested. All contained aloe vera and vitamin C, both of which would attract me to buy a product. I really liked that these products were 82% organic; I think this is great and reassures customers that they aren’t doing any harm to their skin. None of the ingredients concerned me, especially as they were generally better than those featuring in other products I may use on a regular basis. The blue bottle and design of the labelling is really modern and chic. I like that the bottles were heavy as I think this makes them feel more expensive. I enjoyed the scent of both the cleanser and toner also. I think if the cleanser and toner were around the £10 price mark they would be more attractive. My only dislike was the smell and texture of the moisturiser. Other than that I found no faults. I would buy these products as gifts for family members and use the cleanser and toner but partner them with another moisturiser. Natural Wisdom have a clear ‘free from’ section on their website of which we are great fans, and we are also delighted to see that Maeve includes a mention of gluten/wheat in the ‘free from’ attributes, as this is a subject of great interest to many of our readers with coeliac disease and gluten-related disorders, and one which we covered in a previous article. The moisturiser used in our tried and tested review was unscented (ie free from essential oils) and contained raw seed oils - pomegranate seed oil has an especially strong natural aroma. Maeve says that some users find adjusting to the smell of unrefined natural seed oils difficult which is why the vast majority of natural and organic skincare products are made with refined, deodorised oils which, she says, is a shame as the process destroys the oils' nutritional values. The range is free from: alcohol, animal ingredients (including beeswax), silicones, petroleums, parabens, artificial fragrances or colours, propylene glycol and GM ingredients. For further information, see the Natural Wisdom website.